Someone says “library service design”, so obviously, I am interested. And what a fascinating project it was, as part of the Service Design Achievements: the turning of a university library into a learning center – for real, not just in name. The recently formed, but with old roots, Aalto University Library, is really re-inventing itself. Given that libraries have been one of the areas where a move towards service-dominant logic has increasingly meant “let’s remove all sunk costs (e.g., books) as just sunk costs”, and a strong availability heuristic bias (“my kids don’t use the library, so it’s worthless”), this is an extremely positive move. As a library manager and a service designer, I applaud the project. 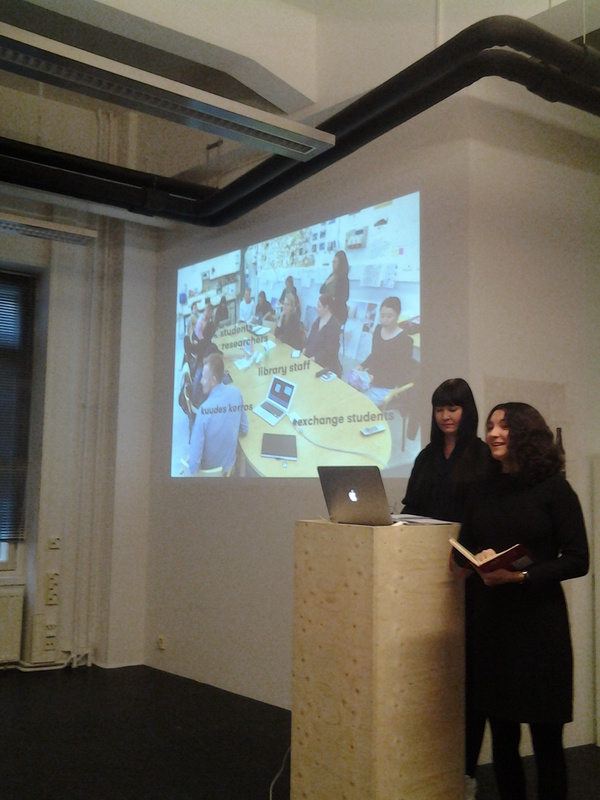 Leena Fredriksson and Valeria Gryada presenting. Now, what have they done so far, if the project is not yet finished? Plenty. It appears that both by themselves, and with Kuudes Kerros, they have not only charted current services (finding out that digital ones are eight times as used as the physical ones), they have gone for a holistic design. Taking as principle the fact that the traditional library almost solely caters for the traditional learning system – cramming – they went looking for other opportunities. So what followed was nearly 200 interviews, most of them short, a few long, around the three Aalto campuses. Through those, they recognized several user needs – some small (“headache”), others large (“migraine”) – and then went on and developed no less than 23 new services for the library users. After prototyping, before implementation, those also went through a second round of interviews and then analysis. Yet the key focus was, and still is, elsewhere. While transforming the library into a learning center, they are also looking to transform the librarians into community managers – experts in not just information seeking, but also project coordination, networking and in the provision of academic relevance through skills and knowledges. In essence, a professional identity change, in which they would still preserve all their own strengths. Furthermore, they employed architects to promote the new services the right way, all the while respecting the work of the original architect of the building, a certain Mr. Aalto. As I’ve written before, optimal placement, including visibility, is often the key with new services. This project, in numerous ways, reflects my own – just on a bigger scale. I will be keeping a very, very close eye on both the architectural designs, the 11 services that they chose for further development, and the ROI that results from all of this.